But if you do eat it at home, beware. This is the kind of salad you'll creep back into the kitchen for long after you've stopped eating. It's just that good, and your taste buds will rule your head. So let's give thanks that at least this is a healthful, binge-worthy dish loaded with fresh summer vegetables, grilled until caramelized and tossed with bright lemon dressing. And there's a little cheese in here, but that never hurt anyone, right? This recipe makes a really impressive amount of salad, so take it along to your next beach picnic. If you serve it for dinner, there will be plenty of leftovers, possibly for days, so absolutely halve the recipe and simply use less of everything if you don't need quite as much. I was inspired by the beautiful farro recently featured on Gilt Taste by Melissa Clark. I chose to forego the crispy cheese (though tempting), pine nuts, and also added zucchini and a lemon-parmesan dressing. In a cast iron skillet, heat farro over medium heat and toast until golden brown and fragrant. Add to a stockpot and cover by at least two inches with water. Boil until tender but still chewy, about 20 minutes; drain and set aside. While the farro cooks, grill the corn over a grill pan lightly coated with oil. Turn them occasionally so all sides have a chance to get charred and caramelized. Set aside to cool. On the same pan, add the zucchini slices and cook for just a couple of minutes, until softened and slightly browned; turn off heat. To make the dressing, slowly whisk olive oil into the lemon juice and garlic. Season with salt and pepper, then add the Parmesan cheese and whisk to combine. Slice off the corn kernels into a large, low serving bowl. 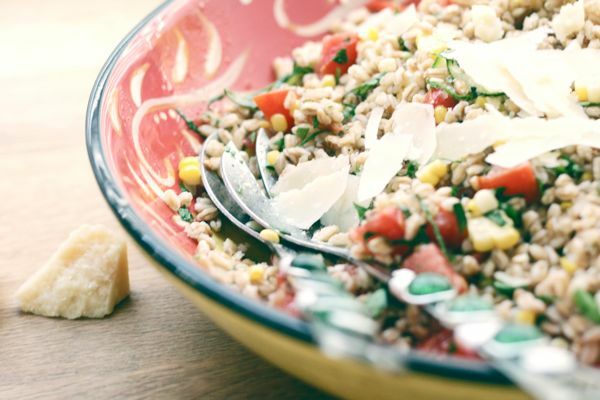 Add the zucchini, tomatoes and herbs to the bowl, then add the farro on top. Pour the dressing over everything and toss to combine. Season well with salt and pepper and serve with additional Parmesan chards.